Now, we have the daunting task of taking down all the Halloween decorations, but before I started that process, I had to get into the kitchen to prepare something sweet for Thanksgiving to share with you. You can make as many or as few pumpkins as you'd like. I made 9 and they were the size of the cute little pumpkins you'll find in the grocery store. 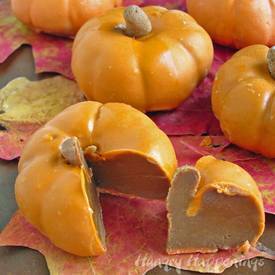 If you decide to make your pumpkins even smaller, you may need a bit more candy coating to cover them all.